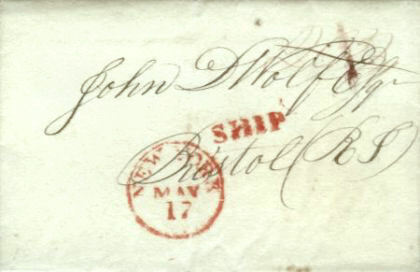 The above cover was sent by Captain Matthew Bennett, the master on one of John DeWolf's vessels from Liverpool, England on April 10, 1825 and concerns the safe arrival of the ship and information on the cargo. It received a New York CDS on May 17, 1825 and was charged at the new single sheet rate of 183/4 cents for mail traveling a distance of between 150 and 300 miles set by the Postal Act of March 3, 1825 and effective on May 1, 1825. It was charged an additional 2 cent fee paid to the Captain of the vessel carrying the letter bringing the total as indicated by the marking on the cover to 203/4 cents. There is also a 1 cent marking overlaid on the original rate marking, which was most likely the fee charged by a local delivery service. The De Woolfe or DeWolf family of Bristol, Rhode Island are descended from the Livonian branch of the De Wolfe family. (The Crest of the American DeWolf's is the same as that of the Livonian Branch.) It is thought that they emigrated from Livonia through Germany and then to England with William the Conqueror in 1066. The first DeWolf in America was Balthasar De Woolfe who is recorded as living in Branford, Connecticut between 1645 and 1660. He is listed as a resident of Wethersfield, Connecticut in 1664 and along with his wife, Alice and their three sons eventually settled in Lyme, Connecticut. One of Balthasar's sons, Edward De Wolf, (1646-1712) married Rebecca sometime before 1670 and their son Charles (1st) was born on September 18, 1673. Charles married Prudence White and their son Charles (2nd) was born in Lyme in 1695. He was the oldest of 10 children and the ancestor of the Guadeloupe and Bristol, Rhode Island branches of the DeWolf family. Charles DeWolf emigrated to Guadeloupe and on March 31, 1717, he married Margaret Potter. Charles remained in Guadeloupe the rest of his life and is listed as a millwright and merchant. The progenitor of the Bristol branch of the family, Mark Anthony DeWolf was born to Charles and Margaret on November 8, 1726 on the Island of Guadeloupe. He was educated in local schools was proficient in several languages. When Mark was seventeen years old, he left Guadeloupe with Captain Simeon Potter of Bristol, Rhode Island. Captain Potter hired the young DeWolf as his secretary/clerk and Mark accompanied Captain Potter on many of his privateering expeditions. Mark married Simeon's sister Abigail in 1744 and in December of that year he sailed from Bristol as First Officer on the privateer "Prince Charles of Lorraine" under the command of Captain Potter. On December 22, 1744 the Prince Charles captured and destroyed the settlement at Oyapoc in French Guiana. During the Revolutionary War, Mark's home in Bristol was burned by the British in 1778 and after this he removed his family to Swansea, Massachusetts for their safety. He returned to Bristol in 1783 and undaunted by his losses, was successful in recouping the family fortunes. Mark served as Quartermaster aboard Potter's privateer “Prince Frederick” under Captain Trowbridge in 1747. Although the war officially ended in 1748, both French and British privateering vessels continued to prey on each others ships. In 1756 Captain DeWolf took command of Potter’s privateer "Roby." Historical records note that in 1757, DeWolf sailed from Warren , Rhode Island in a 50 ton sloop and that during this voyage; he captured a French vessel of 150 tons. DeWolf continued to prosper after he went into business on his own as both a privateer and slave trader. Mark and Abigail had 5 sons; James, John, William, Charles, and Levi; all of the brothers being heavily engaged at one time or another in the slave or "Triangle Trade." The sons, grandsons, nephews and various other DeWolf's were all engaged in or connected to the various family enterprises in one way or another. The family's business interests included ships & shipbuilding, sugar & molasses, slaves, rum distilleries, and Caribbean plantations. James DeWolf also built and operated a textile mill called Arkwright Manufacturer in northern Rhode Island. I have acquired 4 pieces of DeWolf family correspondence; three from the year 1825 and one from 1844. The first is from Captain Bennett to John D'Wolf and concerns the safe arrival of the ship and cargo at Liverpool, England. Two are signed letters from General George W. DeWolf to his supercargo, George West on the Brig "New Packet". John DeWolf was the son of Mark Anthony DeWolf and George was his grandson and the son of Charles DeWolf. The third letter is to William Henry DeWolf who bought George DeWolf's mansion from his father, James DeWolf. The major portion of this article concerns Mark Anthony's sons and grandsons who built the family fortune, although I will also touch on some of the later family history and connections. Before beginning the next section concerning Rhode Island's and the DeWolf family's connection with the Slave trade; it should be noted that in chapter 14, (Bristol) of "The Providence Plantations for 250 years" written by Welcome Arnold Green in 1886, there is not one mention of the institution of slavery or of the DeWolf family's connection to those endeavors. In fact, the DeWolf family was entirely left out of the chapter on Bristol. The only mention I found in the chapter concerning African Americans, was in relation to the population, which in 1790 was 1,406 and 148 Blacks and Indians. (Obviously the 1,406 figure was for white residents.) The chapter does mention the ship Juno returning from Canton with a cargo worth $80,000.00 and the privateer Yankee capturing 8 British prizes worth $391,500.00 during the War of 1812. Both of these vessels were owned by the DeWolfs. The chapter further states that "prior to 1800, Bristol was engaged solely in commerce, agriculture and fishing," with no mention of what that commerce entailed. It would seem then, to readers of this book in 1886 that Rhode Island had absolutely nothing to do with the slave trade.